​Did you know there are many versions of the Cinderella story around the globe? Save July 29th for this exciting world premiere and join us at the magnificent festival stage of Angle Lake Park, one evening only! Experience a soulful journey of Cinderella, unifying dance and music from around the globe in a lively story written and directed by Suzanna Davis, showcasing dance and 100% live music from Egypt, India, West Africa, Spain, US, and Brazil! Originally debuted in 2013 with an Egyptian focus, this year marks a global expansion of this work. Meet artists you know and love, and exciting new ones! Families welcome. All photos by Chris Yetter except where indicated. 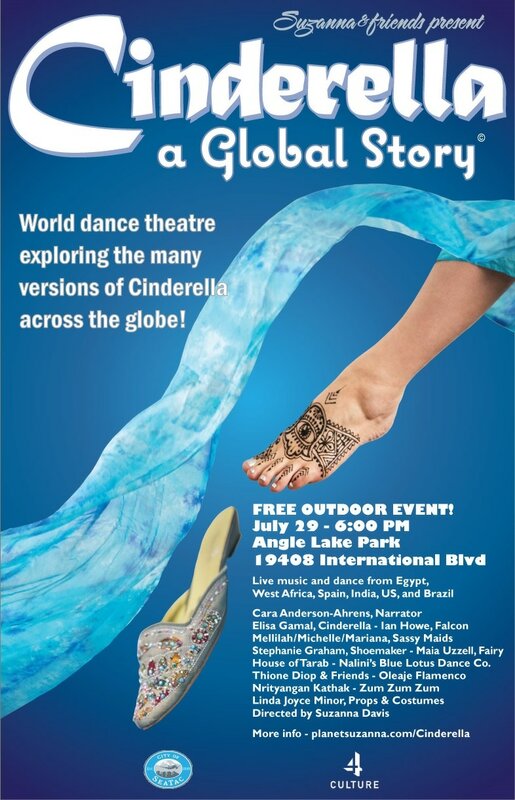 ​With partial support by 4Culture and City of SeaTac, this interactive dance theatre family show explores the many original versions Cinderella across the globe, showcasing over 20 local and international artists. Narrator Cara Anderson-Ahrens and performers take us on a journey through Cinderella's struggle and the Prince's quest to find her, featuring live music and dance from Egypt, India, West Africa, Spain, US, and Brazil. Originally debuted with an Egyptian focus, this year marks an expansion into a global showcase, with continued commitment to bringing audiences into parks for an immersive experience of movement and music with nature. Bring your lawn chair or blanket for extra comfort. Donations and sponsorship to support this work are essential and gratefully accepted. Gratitude to our public sponsors! Gratitude to our individual supporters!